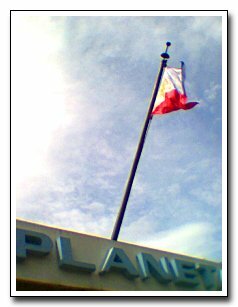 You've probably checked out Angel's entries about the Philippine Planetarium (Seeing Stars, Planetarium Details), and I'm making this other entry just so that I can post this photo of the Philippine flag atop the roof of the Planetarium. 9/9/2003 Update: The Philippine Astronomical Society web site has found a new home! See images of solar eclipses and other astronomical events taken using his videocam. See the position of the International Space Station (ISS) as it orbits the earth. The aim of the Heavens Above site "is to provide you with all the information you need to observe satellites such as the International Space Station and the Space Shuttle, spectacular events such as the dazzlingly bright flares from Iridium satellites as well as a wealth of other spaceflight and astronomical information." The ISS looks like a spaceship, and will make several eye-catching passes over North America. Sometimes, it may be visible from the Philippines in the early evening. I just hope there's not too much light pollution, but given the Government's plan to light up parts of the country (indirectly done as some kind of birth control method), we'll probably just have to squint more.